Unsettled? Time for justice for Australia’s Indigenous people and their ancient, continuing culture. 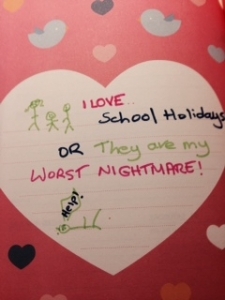 School Holidays….. how are you feeling? ​If we looked at your kinder or school community it is likely that we would see a range of parents’ experience of school holidays. For some it could be bliss – a time to slow down, no school, no kinder, no after school activities or weekend sport unless it is one that continues on regardless. In these households there might be luxurious sleep ins, even Pajama Days when the whole family relaxes at home, fun activities like cooking, picnics, bike rides to the park with friends; simple pleasures. For others it may involve a juggling act of trying to entertain one’s children who have vastly different interests or are at different ages and stages so that even going to the movies is challenging when one film that suits some of the younger children may bore their older siblings witless. Some working parents may struggle to get Leave for these holidays or rely on the goodwill of family and friends to babysit. It may be hard to ask for this help even though their children, friends and grandparents may enjoy this time together. For some parents the school holidays can be a real strain. If they are on a tight budget, many activities may simply be out of reach or require significant sacrifices. For parents grappling with a child or teen’s behavioural difficulties or mood swings, the holidays may seem daunting and endless; especially if they have limited support. Parents of children with special needs may also be suffering chronic stress and fatigue and be concerned about how they will manage the holidays meaningfully with their child when they feel so exhausted. It can be especially distressing for parents who require professional help for their child when that individual is also on holidays. ​While back up is usually available, it may seem unhelpful to tell one’s story to ‘yet another’ professional unless a real crisis demands this. In a perfect world school holidays provide a time for parents and their families to relax, reconnect and rejuvenate. For some it is a time when they are sorely tested and long to return to school lunches,school runs, library bags, even homework as a welcome respite from the trials at home. ​ Let’s spare a thought for those Parent Heroes who lovingly provide enjoyable school holidays for their children, against all odds. If we can help them, so much the better.